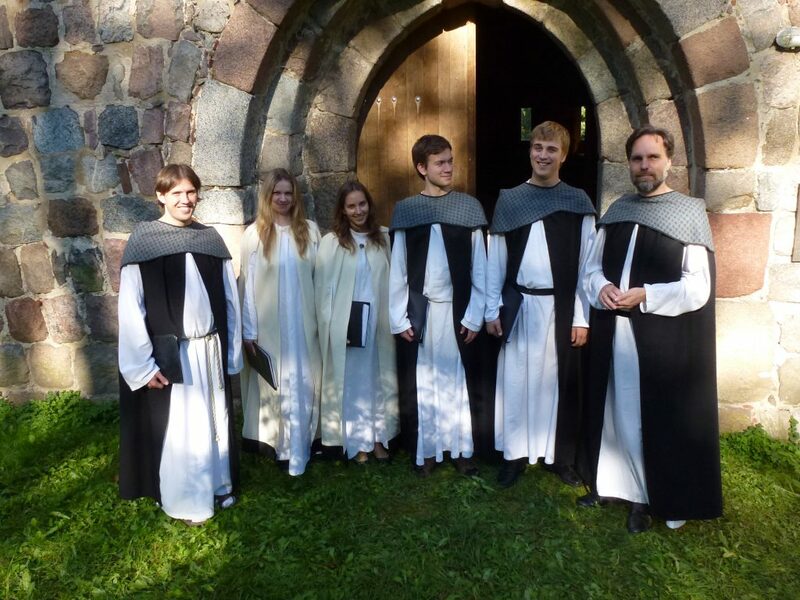 Heinavanker does music with echoes of Gregorian chant, Mongolian throat singing and more. Heinavanker. Photo courtesy of Early Music Now. Early Music Now opens its subscription season this Saturday evening at St Joseph’s Chapel with a concert featuring the resonant sounds of an a Capella group, Heinavanker. The concert transports the audience to a very unique time and place: 14th to 16th century Estonia. Located on the Baltic Sea adjacent to Finland and the Russian Republic, Estonia was isolated for centuries. When converted to Christianity in the late Medieval period (1207) the area continued a unique history. Crusaders of the Holy Roman Empire, Prussian Teutonic Orders of Knights, secular German nobility and local Hanseatic Towns vied for supremacy for three centuries. As I listened I heard something I’ve never heard before, with echoes of Orthodox Chant, Gregorian Chant, choral music of Georgia and the Ukraine, Medieval Organum, Mongolian throat singing, all kinds of things it had some relation to yet so different it clearly was not a direct product of any of the others. And it’s so pleasingly old that it sounds like it could be an old-in-the-new series of contemporary works. It isn’t. This is music you don’t forget easily. It haunts. Led since 1996 by artistic director and composer, Margo Kõlar, Heinavanker includes the balanced voices of Illona Muhel, soprano, Saale Kreen, alto, Johan Randvere, tenor, Christopher Staak, baritone and Vambola Krigul, bass. An a Capella group sing pure tones, not tempered by the compromises of piano tuning. The harmonies create a ringing, open sound of perfect resonance. Overtones are generated in the room. Heinvanker has selelected early sacred chants, polyphonic music and arrangements of ancient Estonian folk hymns. The mix seems more Medieval than Renaissance. But selections will include several mass selections from an early Renaissance composer, Johannes Ockeghem. Ockeghem’s ouvre charms us with its unique musical language. His melodies and rhythmic patterns are accurately calculated, yet at the same time sound very natural and spontaneous. Sovereign parts blend together creating a perfect flow and forming a mystical atmosphere. Maybe this is the connecting joint that weaves together the seemingly distant elements of our programme. Central figures in Haywain Triptych (1516) by Hieronymus Bosch. Photo is in the Public Domain. 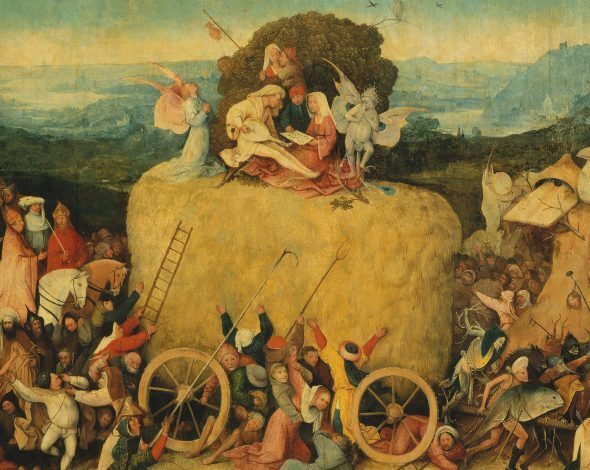 Fun fact: The name “Heinavanker” is inspired by the Haywain Triptych painted by famed artist Hieronymos Bosch (1453-1516). Its allegoric scenes seem as if inspired from today’s life. On this strange painting, there’s a huge stack of hay rolling through a land laboring in acquisitiveness towards destruction. In the midst of this, music arises. Both a snide demon and a praying angel are trying to get the musicians under their domain of influence. Heinavanker is the Estonian word for hay wagon. Saint Joseph’s Chapel is one of few places in Milwaukee with an active acoustic in an otherwise intimate setting. The ambiance is likely to expand the resonance of the voices, particularly in interaction with each other. But those seated near the back of the Chapel are likely to hear too much, as the building’s echos casts its own stamp on the reverberating voices. Heinavanker will perform at 5:00 p.m. on October 20 at Saint Joseph Chapel at the 1501 S. Layton Blvd. A pretalk is scheduled to begin at 4:00 p.m. Parking is available in the lot behind the building, accessed at 29th and Orchard, and on the street. Tickets ($29, $46 adult – $15, $10 students) may be purchased online or at 414-225-3113. The full program listing may be found online.